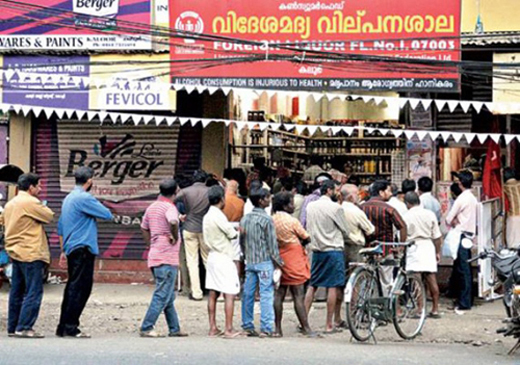 Mangalore, Sep 4, 2014: With the September 12 new regulation of liquor in Kerala, more than 700 bars in Kerala reputed as the highest liquor consumption state in the country will close shop. The post Sept 12 situation in the state is pitting in place an intense effort to close all potential ’backdoors’ that could allow illegal liquor in to the state. Kasargod has five bars which four are three-star establishments, 3 have been not functioning since last April for the non-renewal of license due to the government policy. Going by the govenment decision, after September 12, Kasargod will have only 10 outlets owned by State run Beverages Corporation and a bar functioning at five-star hotel in Bekal. The excise departments big concern is about the porous inter-state border through which spurious liquour can enter from Karnataka or Goa derailing the policy. It is a known fact that currently, on dry days in Kerala, people along the border just walk across to the bars in Karnataka; the trend after September 12 is a new question, also the illegal-transport of liquor will take on new forms. The need for awareness at the grassroot-level are in place in the form of public level meetings at gram panchayat levels to give the message to common public. Besides, a meeting convened by Kasargod District Collector on Sept 3, has resolved to take action against inter-state liquor transporters under Goonda Act. Reports that the private bars located close to Kerala border in Karnataka are also being ‘spruced up’ to tap the opportunity are prevalent. It is said that in the small town of Chemberi near Bhagamandala in Karnataka at least 4 bars are flourishing. Many daily wage labourers residing in the colonies at the hill top villages are prone to liquor addiction. So far the raids have been just a drama it is said. In places like Panathadi, Chittarikal, Rajapuram and many remote places have large stocks of Karnataka liquor, and regulations are known to be just a ploy in the past.